Marrying him was probably the single greatest decision I have or will ever make. But his aversion to vegetables can sometimes really try the Ninj's patience. Wait, I take that back. (Not the patience part, that still stands). He does not have an aversion to vegetables, per se: he has "texture issues." Case in point: he loathes asparagus, doesn't even like to be in the same room with it let alone see it on a plate. But when I got him to try pureed asparagus soup, he loved it. So it's the texture of asparagus that he hates. Ditto with Brussels sprouts. And collards. And broccoli. So when I saw a recipe for a delicious-looking (and weeknight easy) stovetop mac and cheese with broccoli (I love dishes that kill two birds with one stone: no need to make a separate vegetable! ), I knew he wouldn't eat it. Dag: it would become relegated to the list of Dishes To Make When Mr. Ninj Is Out of Town. But then I had an idea. Regular readers will likely remember my "Chef Boy-R-Dee" pasta, in which the broccoli is cooked way down and stirred into oblivion, making it more like a pesto then a vegetable. (It's also my most-pinned Pinterest recipe. People love stealthy and easy stuff.) Mr. Ninj loves that one: no texture issues. Why not use that method with this mac and cheese, too? It worked like a charm. 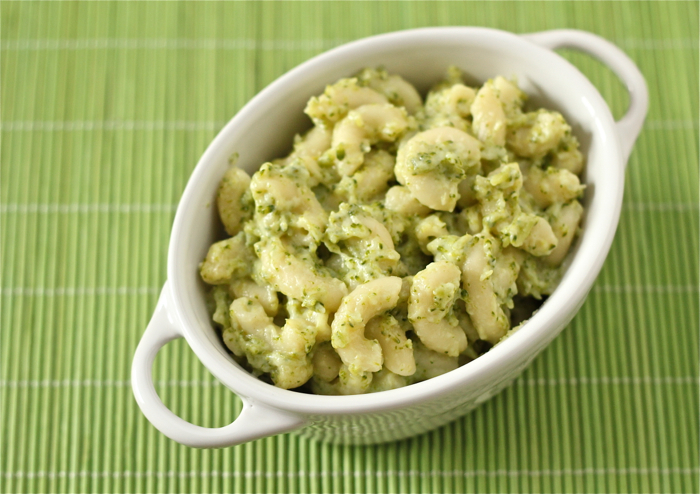 I got the all flavor of broccoli in my creamy, easy, stovetop mac and cheese, and Mr. Ninj got to avoid nasty vegetable texture. Marriage is all about compromise, right? Bring a large pot of water to boil and add the broccoli. Wait for the water to reboil then cook the broccoli for about 3 minutes. Add the pasta and cook according to package directions. When done, drain and stir like a freakin' fiend until the broccoli breaks down. While pasta is cooking, melt the butter in a saucepan over medium heat. Whisk in the flour until the mixture is thick and bubbly (a couple of minutes). Slowly whisk in the milk and continue to cook and whisk until the mixture thickens (just a few minutes, really). Remove the pan from the heat and stir in the cheese until it melts. Add the cheese mixture to the pasta-broccoli mixture and stir thoroughly. Season to taste with salt and pepper. do you think soy milk will do the trick? Or butter milk? Love your attitude, Ninja! Hmmm ... I don't think buttermilk would be wise -- it would taste too tangy. I haven't worked with soymilk enough to know how it would turn out. Sorry. But let me know if you try it! Man, I wish we had texture issues. We have "too much flavor" issues. God forbid your food actually has flavor. ;-) We also have a kid who won't eat cheese. Who doesn't like cheese!?!? I live in a house full of crazies. I do have one other broccoli lover in the house, so I might actually try this. 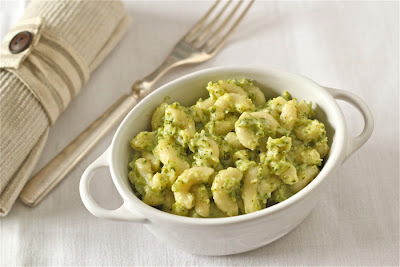 The no cheese kid can have his pasta with butter, the no flavor guy can have his with cheese but sans broccoli, and the rest of us can eat the recipe as written. Or maybe we'll just do take out. I tried this recipe this evening, with a vegan lentil lemon soup and it was a great dinner for my honey and I. Thank you! So glad you liked it -- thanks for the feedback! Hey I nominated you for the Liebster Blog Award!